On 22 January 2019, 12:00-14:00 CET (19:00-21:00 TW) Taiwanese companies will have the exclusive opportunity to win a complete product validation program, FastForward50, that helps you adapt your product and business model to fit the Dutch Healthcare market. The professional jury will have special attention for self-management solutions fitting this year’s theme ‘enjoy Eat, Sleep, Exercise!’. Update of 5 Taiwanese Innovation Demo selected!!! Would you like to make your healthcare product available in Europe? The Netherlands is The European country where 17 million people spend 100 billion on health yearly – the fifth/sixth market size in Europe. The Utrecht province is recognised as test bed for eHealth innovations and offers selected companies support to get to the market. In the past 2 years it launched the FastForward50 support program to fast track eHealth innovation to the market. This year it is opening up its support system for Taiwanese companies working with TGN exclusively. When your eHealth company has the ambition to access the European market, you should register before your working day ends on 18th of January for this unique opportunity! From the registered companies the selection committee will nominate max. 10 companies on January 19th . Nominated companies will then be invited to pitch for the Jury to pitch virtually on the 22nd of January. Nominated companies will be supported by Tiger Accelerator Taipei on 21st January to fill in the pitch form and prepare the pitch video. Nominated companies will be promoted online and during the Dutch eHealth Week at the Taiwan eHealth Innovation Hub. To be eligible for this demo & pitch opportunity on 22-01-2019, you’ll contribute € 375 to Tiger Accelerator Taipei. With more than 20 products successfully launched to the market in the past 2 years, FastForward50 has proven its approach that integrates citizen’s needs, healthcare needs, solutions and healthcare system requirements. Prepare: in the first month FF50 will help you make a detailed validation plan. Develop: in 50 days you’ll go through a 4 step program: 1. Verify the needs addressed by you solution with the help of a group of citizens. 2. Use the living lab to test your solution. 3. Receive help with developing a business model fitting the Dutch healthcare market. 4. Receive professional help and validation feedback from academic and business organisations. 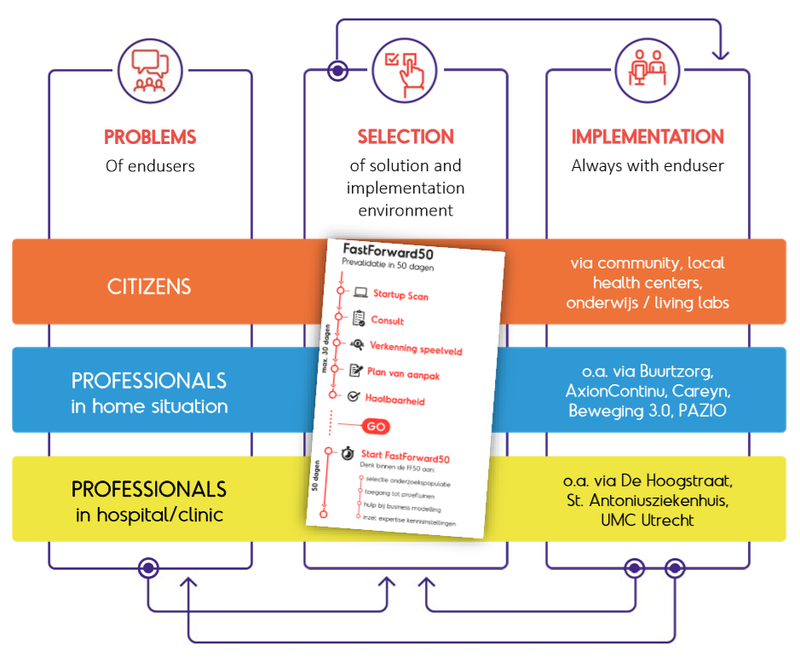 Implementation: when you’ve developed a profitable solution, convincing for citizens and professionals, you can count on their support when you decide to commercialise your product/service in The Netherlands.